File cards have always been an important part of the G.I. Joe: A Real American Hero brand. Originally conceived as character profiles by Larry Hama, these concise biographies breathed life into countless characters over the years. Through these cards fans learned of the tragedy of Hit & Run’s parents, Tripwire’s time in a monastery, and even Altitude’s photographic memory and short-lived career as a cartoonist. However, one file card storyline sticks with me like no other—carried out piecemeal in three separate biographies and that’s the story of the Stall family: Barrel Roll, Black Out, and Bombstrike. These three characters have a shared history that features family crisis, treachery, and a feud that threatens to leave one or more of them lying in a shallow grave. 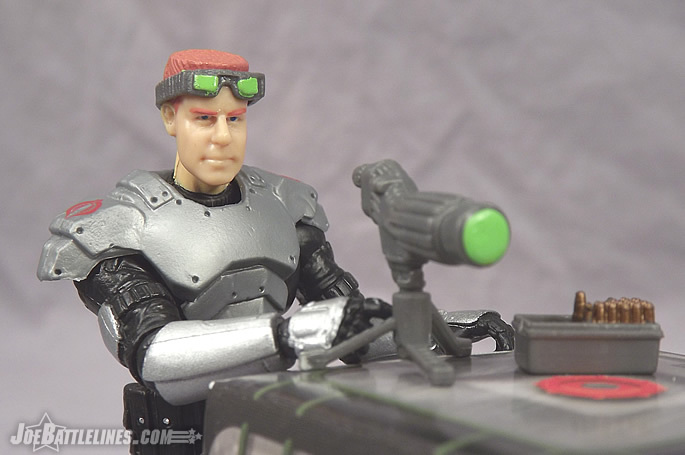 Like many Joe fans, I was thrilled to see that Barrel Roll was included in the first series of FSS figures but I was ecstatic to see that Black Out was the “13 th mystery figure” in the first subscription series. However, anticipation can be a tricky thing and can elevate expectations beyond a realistic level. Was this the case with the G.I. 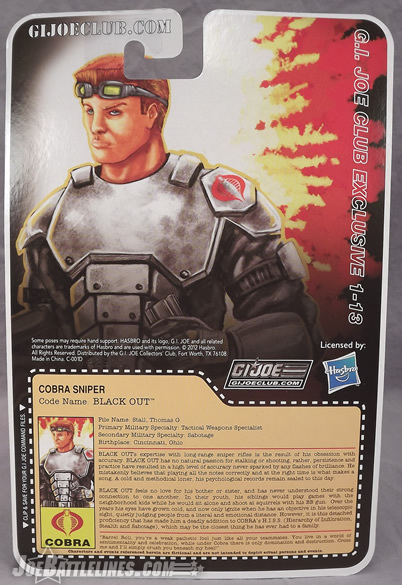 Joe Collector’s Club version of Black Out? Did he live up to my fan-boy desires? Read on, and find out one Joe fan’s opinion! When it comes to the body construction, Black Out shares a decidedly mixed parentage. 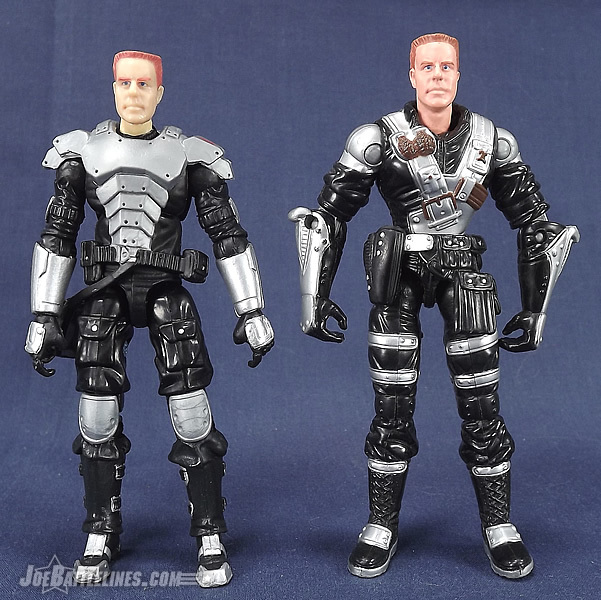 According to YoJoe.com, Thomas Stall is comprised of the torso of the initial 25 th Anniversary Snake Eyes, the arms of the Rise of Cobra Sgt. Flash, and the legs of the G.I. 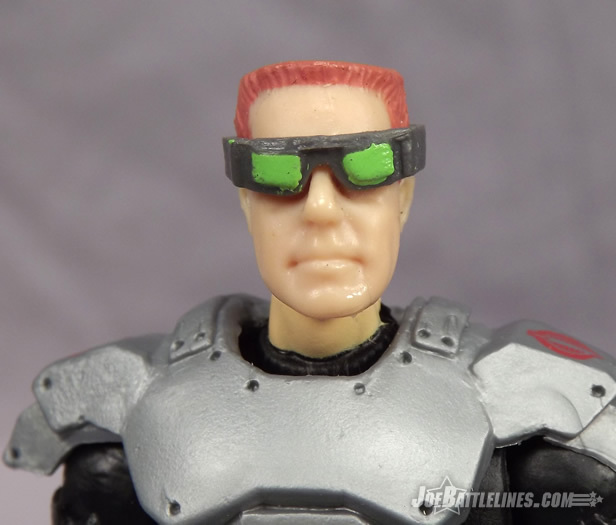 Joe Resolute Snake Eyes. That’s a decent body parts combination that pretty adequately resembles his original O-ring release from 2003. Silver paint applications accentuate the forearm guards as well as the plates on hands and boots. 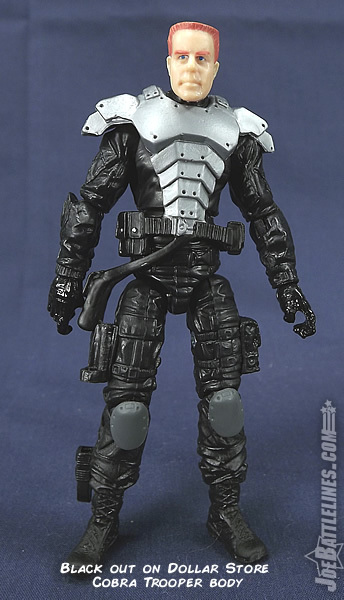 The body armor from the Resolute Zartan is placed over the top of this to give him an armored look that was so distinctive in his first release. 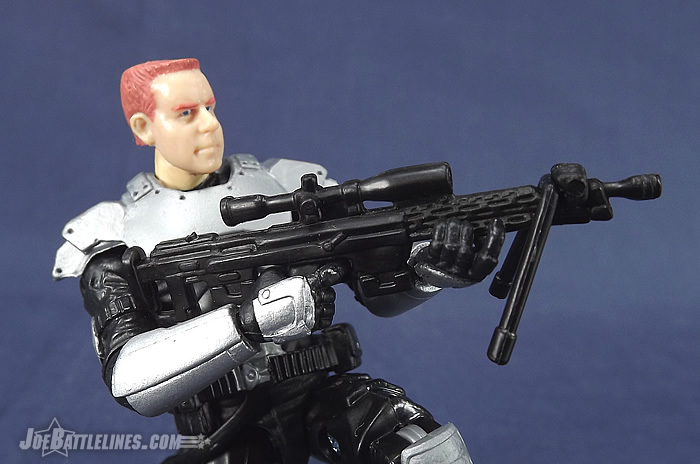 It’s important to note that this parts choice also gives him sculpted trigger fingers on both of his hands can be useful for a sniper figure. I will admit that I miss the inclusion of the hinged wrist articulation that has become some prominent across the brand. For a rifle-based figure, that additional flexibility can be crucial in allowing the figure to assume a reasonably accurate rifle stance. 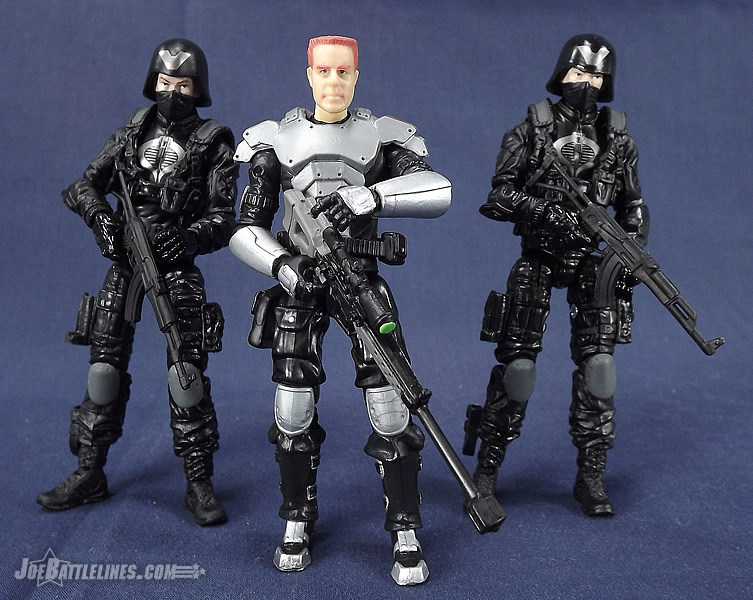 I might have suggested replacing the arms (or even the body) with parts from the amazing 30 th Cobra Trooper to add to the overall range of motion. Plus, it would give Thomas a bit more height as this figure is slightly shorter than the original O-ring release. Overall, it’s a good but not perfect body choice. I’ve got to give the G.I. 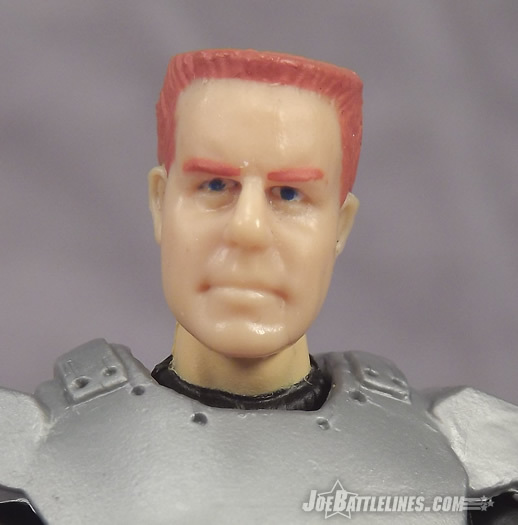 Joe Collector’s Club props when it comes to utilizing existing head sculpts. 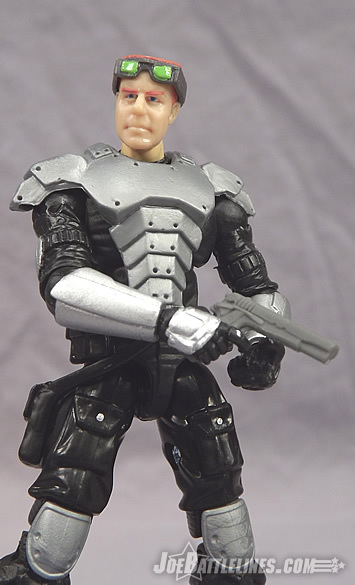 As previously stated Black Out’s only other release was on an O-ring body and featured a more traditional head/neck sculpt. The GIJCC went back to that mold and reworked it to function with the newer ball-jointed neck joints and the result is rather impressive. 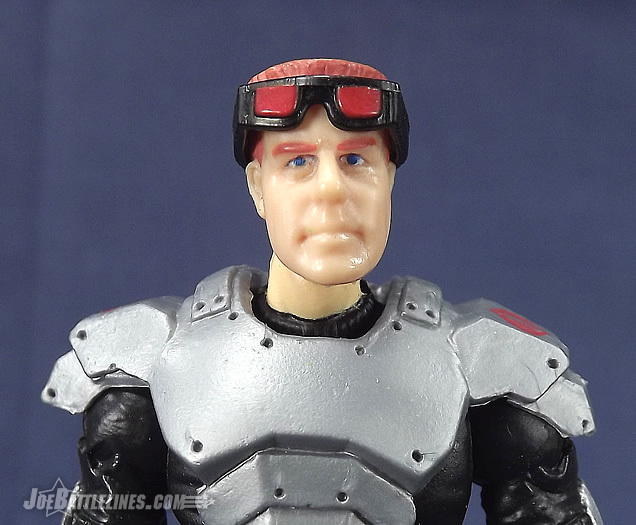 This is the original Black Out head sculpt brought forward to the new style body! No one can say that this figure doesn’t look like the original in that respect! It also means that this version has both the strengths and weaknesses of the prior release. The head still appears a bit narrow to my eye as it always had and it does seem a tad small in proportion to the rest of the frame. 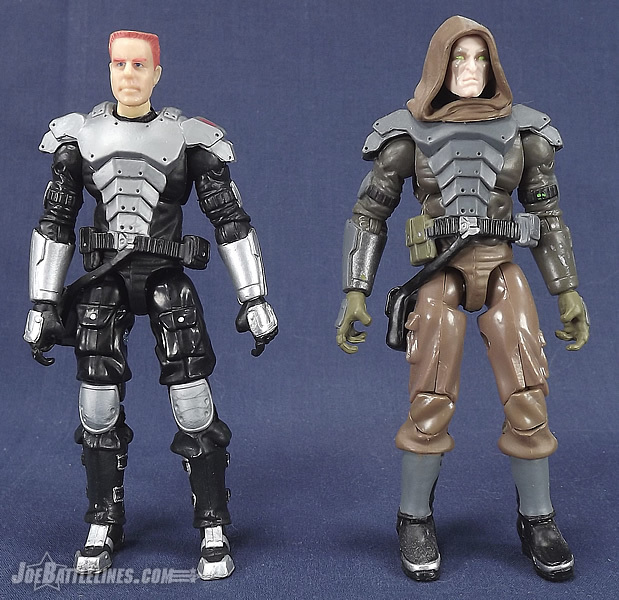 This last observation could be due to the fact that the Zartan shoulder pads add extra bulk to the torso, making him appear a bit wider than he really is. The combination of the narrower face and the exaggerated flat-top hair cut can give him a cartoony appearance but it’s also the only one he’s ever had. 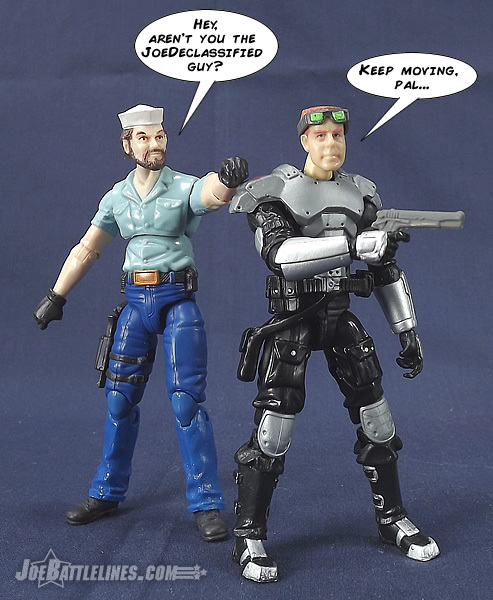 When it comes to Black Out’s kit the GIJCC managed to produce a decent, if not perfect, assort of gear. 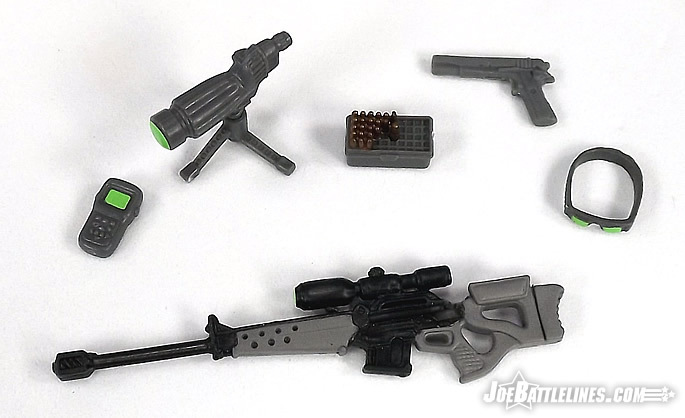 The Cobra Sniper borrows from the 30 th Anniversary Low Light figure by including his spotter scope, bullet case, and infamous “single bullet”. 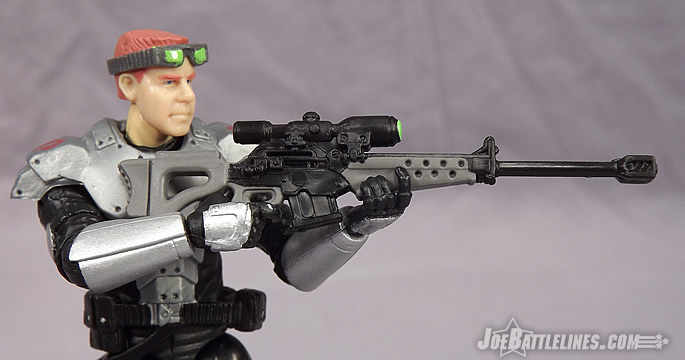 He also comes equipped with a cell phone, automatic pistol, the Resolute Zartan sniper rifle, and his signature goggles. In contrast to his initial release, all of the screens and lens in his kit have been given a bright green paint application—possibly to hint at night vision capabilities. (Either that or it just looks cool.) The kit works although I’ve had some difficulty getting the sniper rifle to fit properly in the figure’s hands due to the restrictive nature of the rifle stock and grip. The rest of the gear is pretty close to perfect and I’ve zero complaints about the choices made here. 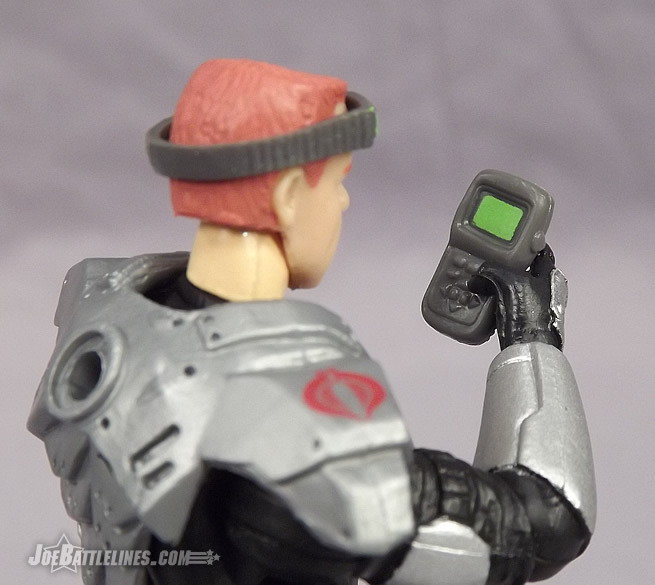 It’s a logical set of equipment and I love the fact that he has a cell phone with which to receive his orders. Black Out was a surprise to many fans who subscribed to the first round of the Figure Subscription Service and a welcome one at that. His body construction is very faithful in appearance to his initial release although it does lack some of the added articulation that fans have come to expect from recent G.I. 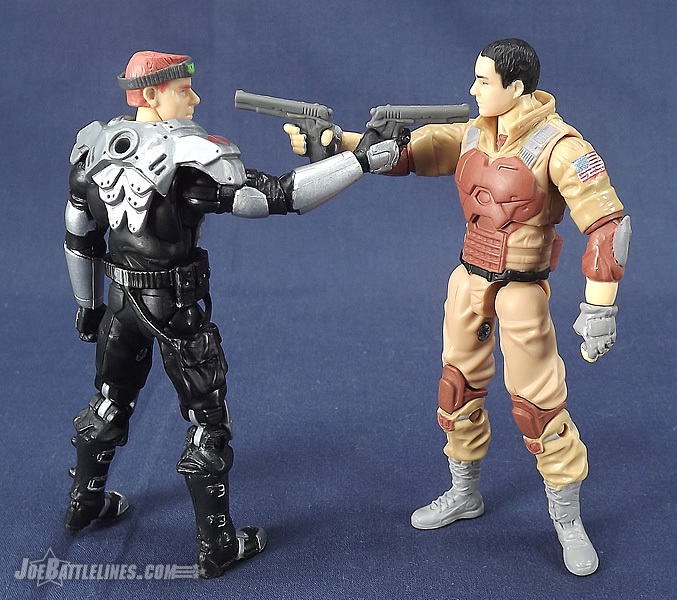 Joe figure releases. 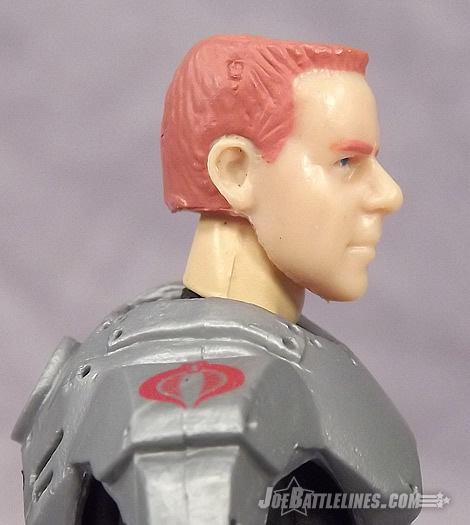 The head sculpt works with the altered tooling even if it does appear a bit dated. I wish he was taller but it’s not a deal breaker. 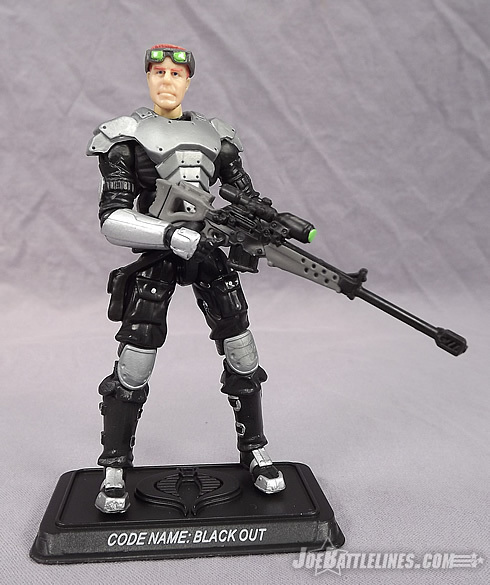 At the end of the day, I’d say that, aside from some minor details, Black Out is still one of the better releases in the FSS to date. 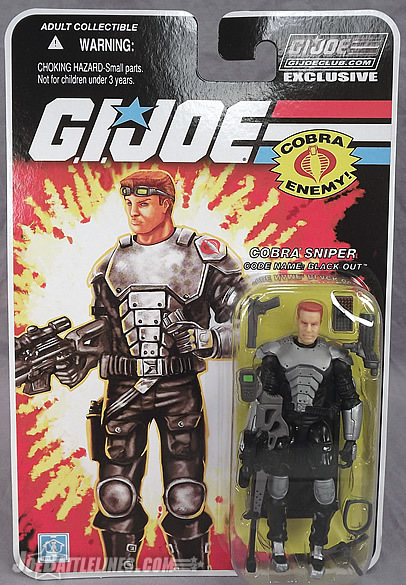 He’s a character that hasn’t been over-exposed to the point of fan malaise (SNAKE EYES) and he’s never had a generation 3 release. Fans of his file card story are going to want to add him to their collections, provided the price is right. The bottom line: A solid addition to any generation 3 collection. He’s not perfect but in spite of a few issues he’s worth picking up for a decent price.